GALION — Galion City Schools staff and students took time Friday to honor America’s heroes. All four buildings participated in activities to show respect for veterans. The High School and Middle School program started with the presentation of the colors, followed by the High School band performing the “The Star-Spangled Banner.” George Harmon spoke to students, followed by the presentation of high school diplomas to area veterans who left school early to serve in World War II, Vietnam or Korea. “I served in the Navy aboard a Yard Mine Sweeper, YMS-407,” Harmon explained. “Minesweepers are the smallest of all the Navy ships and their hulls are made entirely of wood, not steel, in order to not be blown up by magnet mines placed in the water by the enemy. Harmon’s son, Craig, spent some time in Washington, D.C., doing research at the National Archives. He discovered the actual deck log for the YMS-407. The event described in that log was the event the famous Iwo Jima Memorial in Washington D.C. is based on. Students and staff shook hands with Harmon and other veterans in attendance following the program. The Intermediate and Primary Schools honored veterans with a “Show Your American Spirit Day.” Each grade level is being asked to wear a different color of the American flag on Monday, Nov. 12. Third-grade and kindergarten students were asked to wear red-, fourth-grade students white slothing and fifth-grade students were asked to wear blue. Staff also were allowed to wear red, white and blue, too. “These activities are important to remind our students and staff of those who have fought for their freedom,” said Galion Superintendent Jim Grubbs said. “I would like to thank all our veterans for their service to our nation. Courtesy photo George Harmon, 92, and a World War II veteran, was the guest speaker last week at Galion High School as students and staff celebrated Veterans Day. A long-line of students thanked Harmon and other graduates for their service following the program. 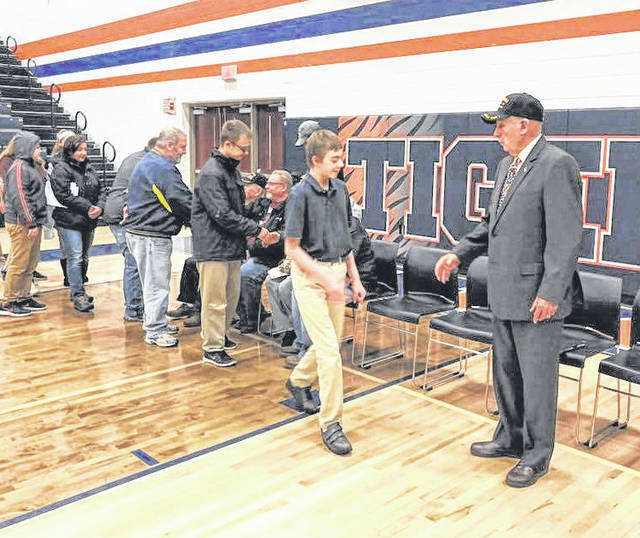 https://www.galioninquirer.com/wp-content/uploads/sites/38/2018/11/web1_Harmon-again.jpgCourtesy photo George Harmon, 92, and a World War II veteran, was the guest speaker last week at Galion High School as students and staff celebrated Veterans Day. A long-line of students thanked Harmon and other graduates for their service following the program.